(out of almost 1,000) released in UK cinema in 2018. POSTCARDS is placed 4th behind ROMA, THREE BILLBOARDS OUTSIDE EBBING MISSOURI, THE HAPPY PRINCE. "The film never finds one positive thing about Brexit, but then neither has the UK government..."
A documentary film made by and featuring those who voted Remain, the 48%, to show the other 27 EU Member States that it was far from a landslide victory and just why we are fighting to stay part of the EU. "A deeply considered film that presents a case for questioning Brexit and the way in which it is being handled…..two moments stand out….featuring Campbell, is a dictum to the effect that we have to talk sense in order to make people see sense. That phrase sums up perfectly the modus operandi of Wilkinson’s film." "Wilkinson’s thoughtful, lucid documentary unashamedly gives voice to the “ losers” in a poll that leaves the country facing its greatest challenge since the Second World War……Ardent Leavers will have no truck with an admittedly one-sided film but with politicians in 2018 still squabbling over the outcome, maybe a diligent documentary encouraging a pause for (second) thought is still worthwhile considering what’s at stake." On the 23rd June 2016, the UK voted by 52% to 48% to leave the European Union. Despite both sides having been widely accused of relying on information ranging from the crudely distorted to the unashamed lie, neither side presented any of the precise information that should have been made available and thoroughly explored when addressing so momentous a choice for the future of the United Kingdom. Such irresponsibility meant that most voters were left to decide on an issue of colossal complexity based on nothing more incisive than personal emotion or partially informed preference, without the slightest indications of any actual consequences that such a choice was likely to result in. Regardless of the extreme modesty of a Leavers victory, every day has subsequently pressed inflexibly and uninclusively forward towards the precipice of EU departure, in spite of a growing catalogue of unanswered questions, economic uncertainties and deeply negative warnings that have come to light in its wake. In a landscape where the only voice to be heard comes from those ignoring completely the views of nearly half the electorate in their headlong rush to Leave - come what may, this film is an attempt to inject facts and points of view from Remainers into the process in order to redress the partiality demonstrated by such an inappropriate imbalance. "Dirty Gem… Highly insightful documentary provides detailed and finely corroborated arguments as to why Brexit is nothing short of a disaster, and it also conveys a necessary message of blue hope… The helmer is often in front of the camera, making this an intimate and conversational piece of film-making." "The film never finds one positive thing about Brexit, but then neither has the UK government... Carefully avoiding sensationalism, this is an honest, articulate attempt to find the facts in a situation that seems inexplicable... skillfully edits together comments by campaigners, celebrities and people on the streets." When David Nicholas Wilkinson started working on the film in 2016, many people advised him to make a ‘Soft Brexit’ film, not a ‘Stop Brexit’ one. By the time he finished shooting his last scenes as late as May 2018 however, the ‘Stop Brexit’ message did not seem quite so fanciful. There was just one rule on the film: everyone involved in the production had to have voted Remain. Whether people are in agreement with the message of this film or not, it speaks for 16 million people (and counting) who live in the UK. That’s more than the population of Belgium or Greece or eighteen of the other EU member states. Their voice, their preference, their mandate deserves to be heard. "In calm, vicarly manner, David Wilkinson gathers and binds a pretty much unarguable case for persisting in trying to overturn Brexit... Wilkinson at least has the decency, unlike the Leave campaign, not to pretend that he has all the solutions." 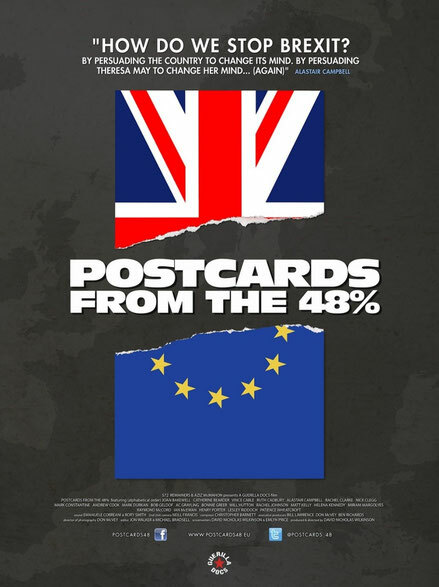 "The film is considered and thoughtful, and ends with a plea for a genuine democratic power and a popular veto in the final Brexit deal..."
London, Dover, Folkestone, St Margaret’s Bay, Poole, Bath, Bristol, Ebbw Vale, Criccieth, Stoke on Trent, Norwich, Sheffield, Manchester, Fife, Omagh, Derry, Pettigo (Northern Ireland), Pettigo (the Republic of Ireland), Galway and places in-between. "Ian McEwan’s knowing quip about Remainers being "hobbled by a fatal attraction to rational argument" holds equally true for Wilkinson’s thoughtful, respectful, polite film. This is a valuable memorial for future generations, undoubtedly." "Well worth a watch: a really interesting, sober and levelheaded view on the referendum vote..."